Remember that these pages are all pictures, so be patient while they load. 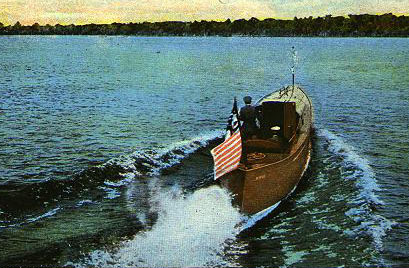 Miss Conneaut X, an early 1930s 30' Hacker Craft. 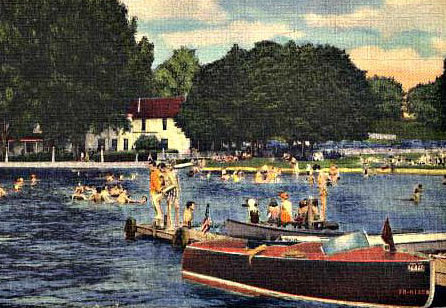 The boat in the background is a 1958 Chris Craft Holiday 18', and the building across the lake is the Oakland Hotel which was razed in 1967. So we can date the photograph between 1958 and 1967. Most likely earlier than later, due to the linen type postcard. Also the Miss Conneaut appears to have a license plate which would date the picture 1962 or earlier. From the Postcard Collection of Kate Hilton. Another shot of Miss Conneaut X, The lucky driver is George Berkey. The rather dour fellow on the left is Jess Caldwell. 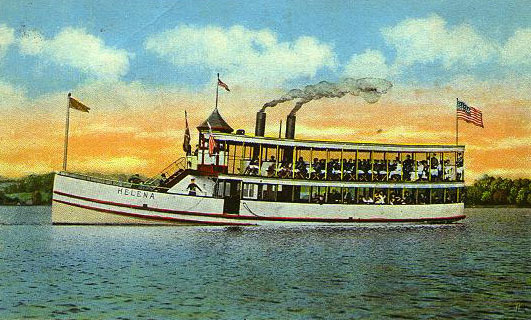 On Conneaut Lake, from the early 1900s the steamer, Helena. 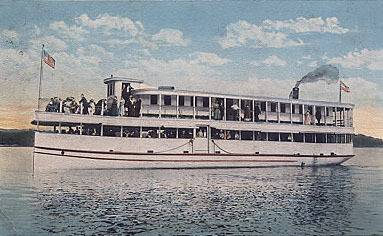 On Conneaut Lake in the 1920s, The new steamer Pennsylvania. 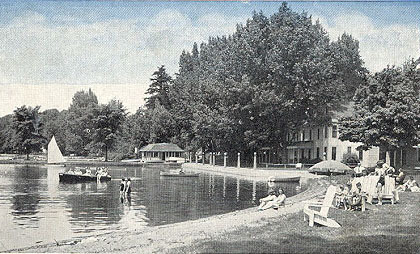 The Hotel Elmwood at Conneaut Lake Park. The boat is a Late 1930s Garwood 16' Split Cockpit Runabout. 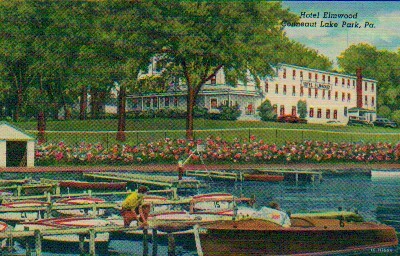 On Conneaut Lake, 1930s Midway Hotel. Midway Hotel, The boat is a early 1940s Century 17' Utility. 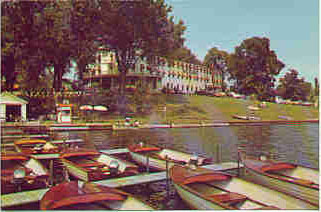 1950s The Elmwood hotel at Conneaut Lake park. 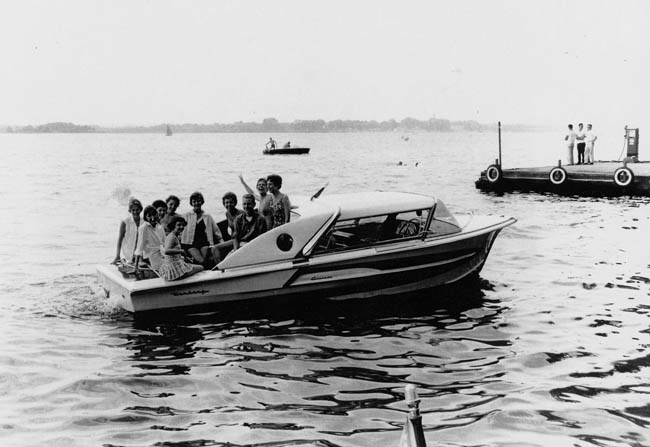 The rental boats are some of the first MFG boats built. These boats were originaly open rowboats. But were too heavy. They were decked over and engines were added by Paul Scofield of the Conneaut Lake Nagavtion Co.
1942, a new 1942 Century Seamaid 17' owned by Arthur and Stanton Lowrie. Pictured is Stanton. The photo is taken on the east side of Conneaut Lake. The large clump of trees above the rear flag is Wolf Island. The boat is still in the family owned by Arthur F. Lowrie Jr. This boat is currently under restoration. Click here to see a current photo. 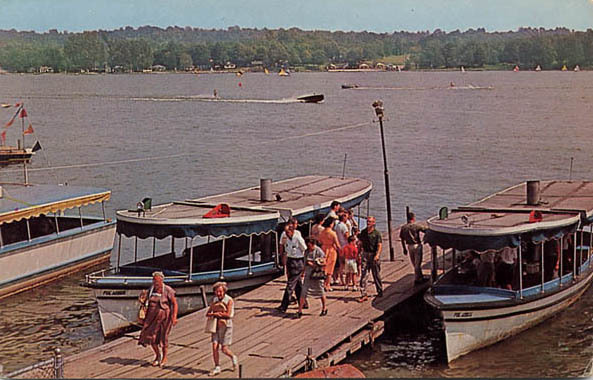 An early 1960s postcard from the public docks at Conneaut Lake Park. 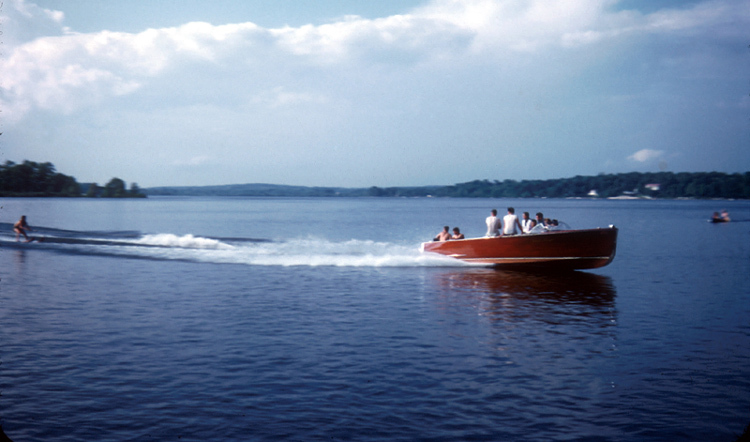 The boat on the left is a Dumphy X55, the lapstrake boat in the foreground is a Thompson, and the boat on the right is a 1962 Century Coronado which at that time was owned by Fred Fiore of Pittsburgh. That boat is now owned by Allegheny Chapter member, Fred Hartman. 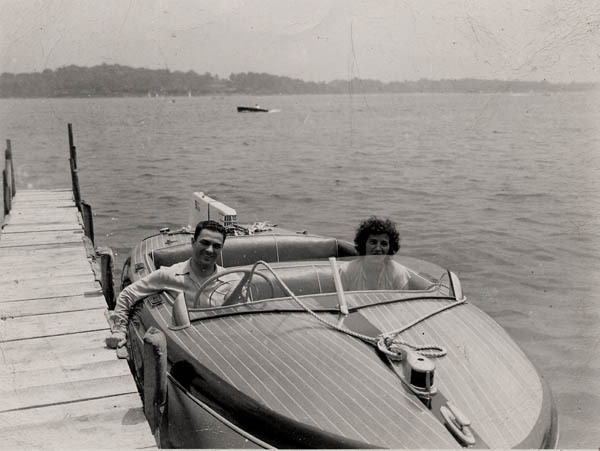 On the west side of Conneaut Lake, a 1947 photo of Guy & Mary Gully in their new 20' Ventnor Sport Runabout powered by a straight 8 140 hp. Chrysler. 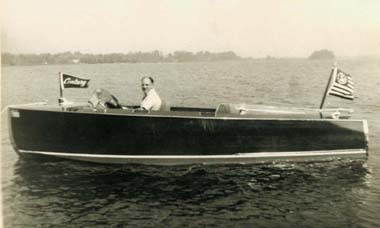 They sold this boat one year later to buy a 23' twin engine Ventnor Runabout, which they ran until 1955. 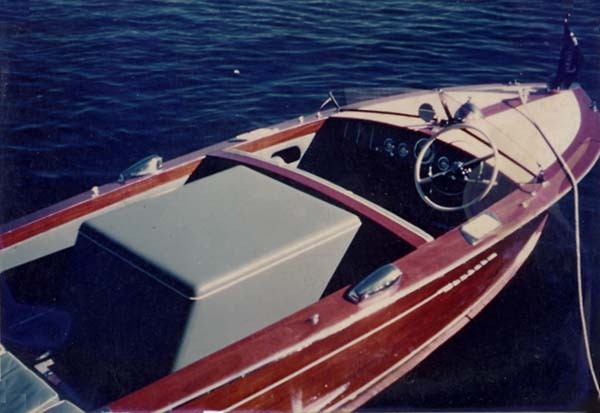 In 1955 they bought a 21' Chris Craft Cobra. 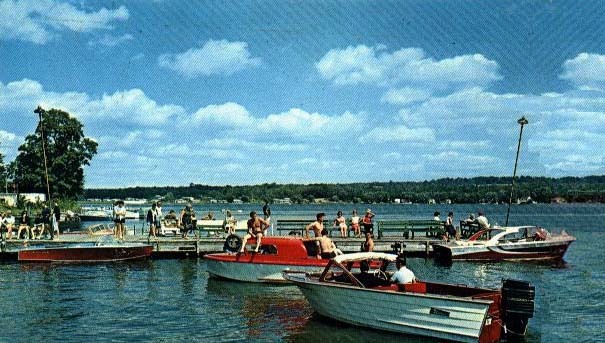 During a Conneaut Lake Ski Club Show in the late 50 or early 60s some where between 1958 & 1961. Boats in this photograph are from L to R, 1955-1957 Century Palomino, Un identifiable, 1958-61Century Resorter 19', 1955 Century Resorter 16', Unknown rowboat, behind rowboat unknown, 1955-56 Chris Craft 21' Capri, Early 1950s Chris Craft Holiday, 1950s Century Resorter, and in front a Lyman, owned by chapter member's Laura Jones' father . The three pictures are of a 1955 Century Palomino 15' taken August of 1955. 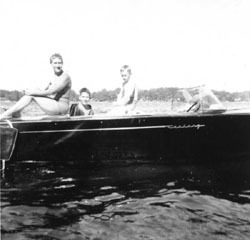 The boat was bought new in 1955 by Paul (Baldy) Johnson,and his wife Martha (Bunny) Johnson. 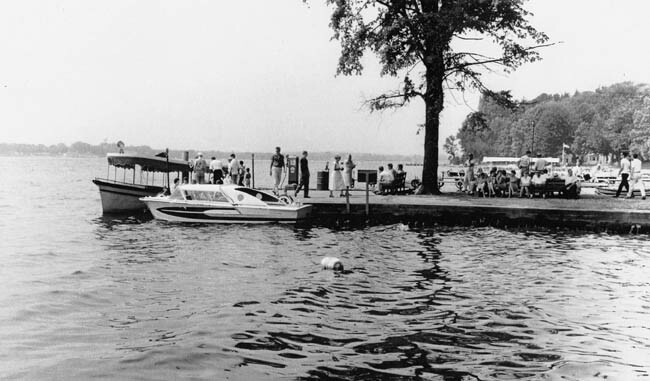 They purchased the boat from Reniman's Marina in 1955. The boat was also kept at their Marina and stored in their boat house in the winter. The Johnson's sold the boat in 1962. The photographs were provided by their son Chuck Johnson. Chuck also identified that the palomino is the same one as in the ski show photo above. 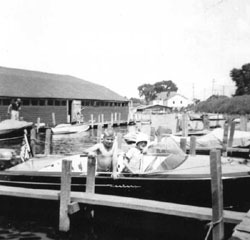 Reinman's Covered boat shed in the background of the first two photos was torn down in the 1960s. The third photo was taken off of Wolf Island. Click here to see a page on this Coronado. 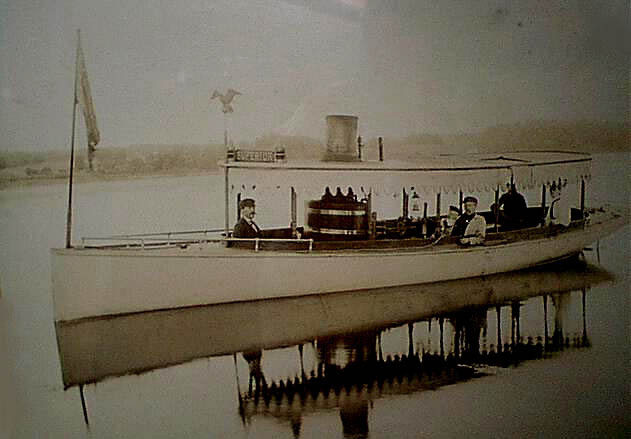 On Conneaut Lake, a large triple cockpit runabout. This boat may be one of the Miss Conneauts, we do not know. 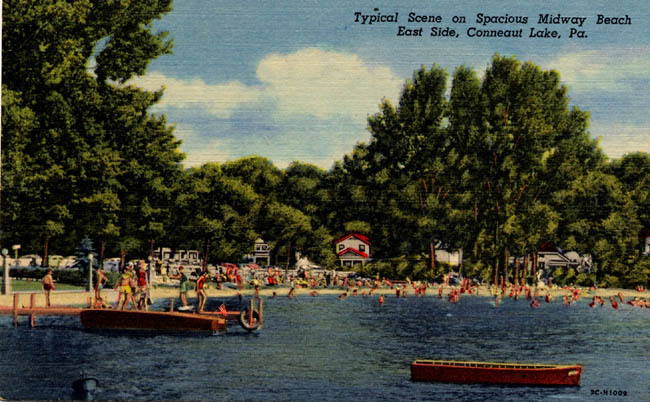 The photo comes from a postcard from Canadohta, Lake but the background clearly matches the shore line across from Conneaut Lake Park and Canadohta Lake is not that large. The photo is pre 1956, since that's the postmark date. The unmatched planking suggests that it is a Hacker Craft, but we are not sure. 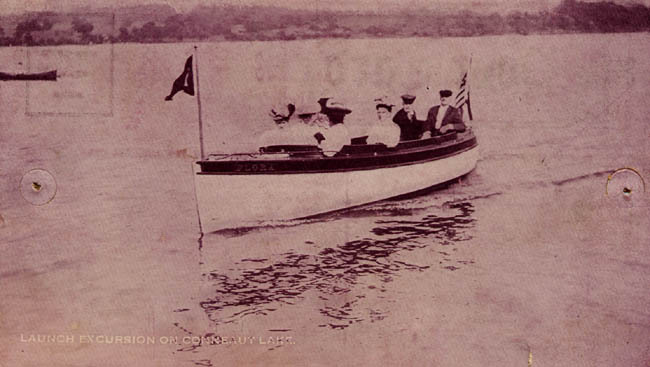 This photograph was taken right at the turn-of-the-century and it features members of the Huidekoper family aboard their steam launch, the "Superior" on Conneaut Lake. The Huidekoper family was the founding family of Meadville, PA (eight miles from Conneaut) and their family mansion stands to this day open for tours in the city. They built a (second) magnificent Victorian mansion at Conneaut Lake as their summer home, which still stands to this day and remains a private residence. This photograph was taken W. W. Wilt, who also took many of the photographs which were used as postcards. 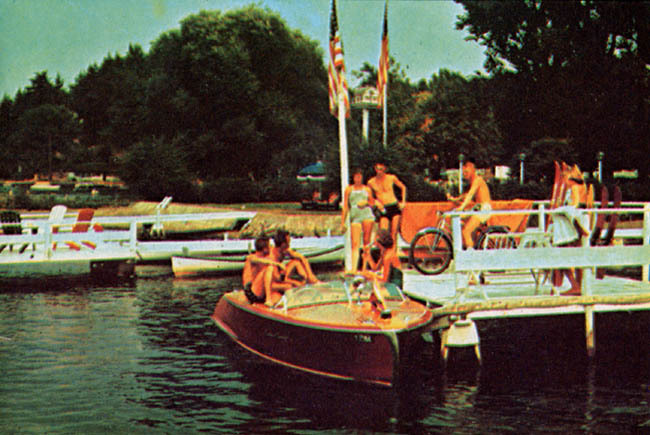 A 1963-1967 postcard of a 1942 Century Seamaid 172 covered at Firemans Beach docks. The boat is now owned by Frank Miklos an is presently being restored. 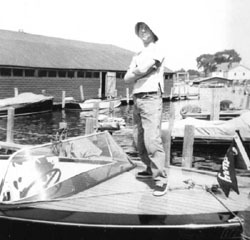 This is the boat that was turned over at the Allegheny Chapter's Fall 1999 wookshop. This boat is currently under restoration. Click here to see some current photographs. 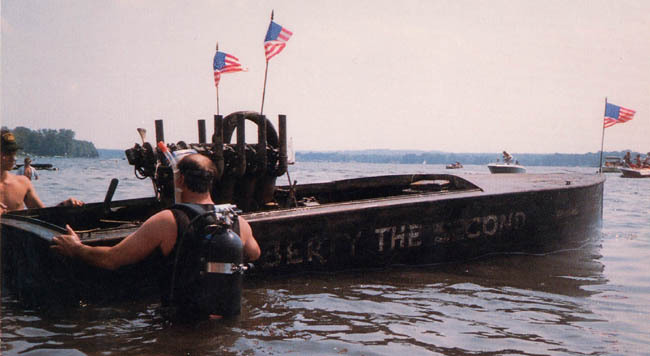 A 1985 photo of Liberty The Second just after being raised from the bottom of the lake. She sunk after a steering mishap in September of 1922. When raised the boat was pumped out and floated down the lake to Renimans Marina. The boat was restored and run on Conneaut in 1987 and is now on display at Conneaut Lake Park. She is pulled outside each year and is on the land display at the Conneaut Lake Classic show. Click here to see more photographs of Liberty the Second. The boat at the left is one of the Miss Conneauts we believe that it is one of the 30' Hacker Crafts. other boats in this photo are a Chris Craft Delux Runabout and a Higgins Utility. 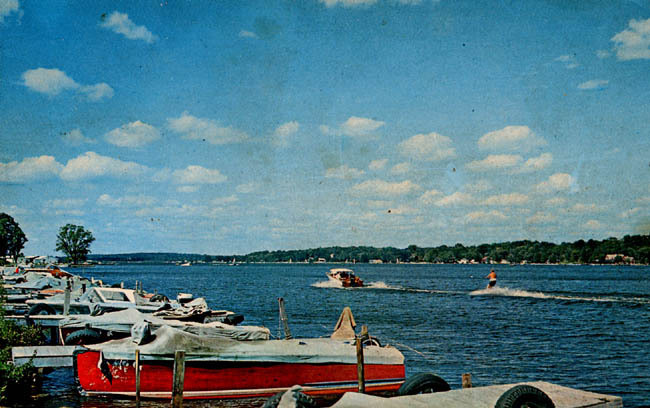 At Midway Beach, between 1950 & 1954 a Chris Craft Riviera and an unknown wood rowboat. 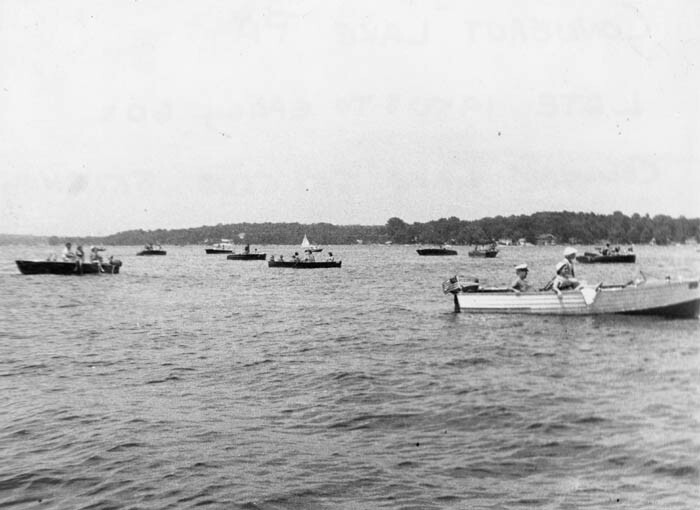 An early 1900s photo of an unknown launch on Conneaut Lake. The boats name is "Flora". An 18' Chris Craft Riviera at a private dock Just south of Midway on the east side, at the Laughlin cottage the next two cottages are/were Weaver then Engroff/Gordon. The large Martin bird house in background is on Gordon front yard. This photo was taken in one of three years, 1951, 1953, or 1954. 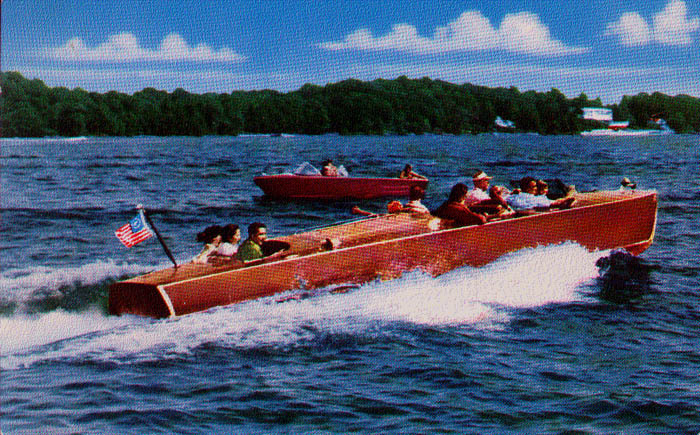 This photograph was taken from a 1962 Pennsylvania tourism book. It was printed backwords in the book, we have corrected the photograph for use here. Thanks to Joe Egolf Bill Gorden for letting us know where this photo was taken. On Conneaut late in the summer of 1955 a new 1955 Century Resorter 16' bought new by Dave Eriven of Aspenwall, PA. The boat is powered by a 110 hp Chrysler 6 cyl engine. This Kodachrome print is dated the week of October 31, 1955. From Ramsey Frist: a wonderful scan of a early 1950s slide. Coming out of Huidekoper Bay heading towards town. This photo was taken during a high school class party in either September of 1953 or 1954. 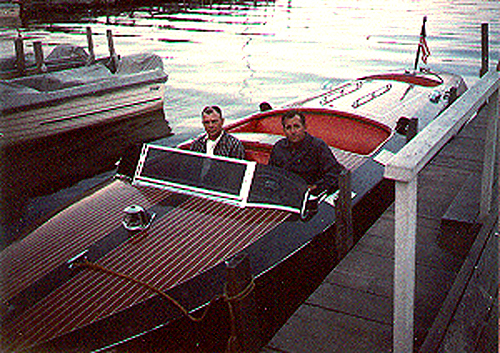 The boat belonged to Ralph Moss, it is a late 1940s or early 1950s Chris Craft 22' Utility. As I remember it was one of the largest speedboats on the lake. . The picture was taken from the dock at what was then the Moss cottage on the West Side. Wolf Island is seen on the left. Robert Moss the son of Ralph still owns the boat and it was just restored. In June it was back in the water for the first time since the early 1970s. 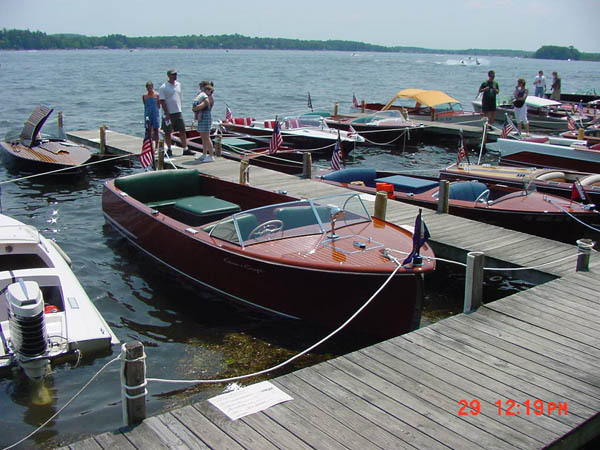 It was on display at the 2002 Conneaut Lake Classic Boat Show in June. Click here to see a photo of the boat from the 2002 show. 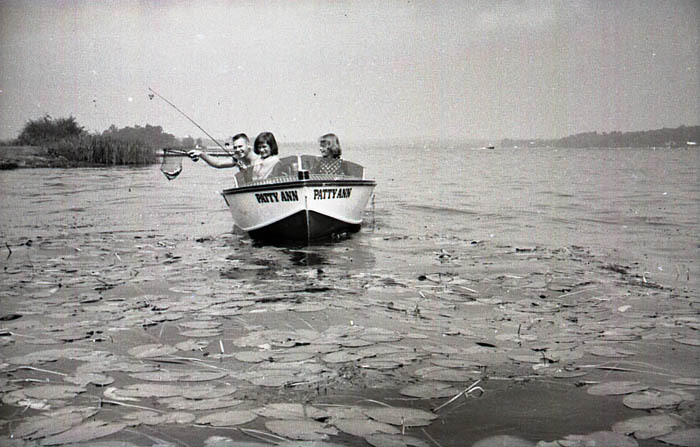 On Conneaut Lake in the summer of 1955 The boat "Patty Ann" with it's owner Billy Miklos. This photo is taken on the west side of the lake just north of Fireman's Beach, the tip of Wolf Island can be seen in the distance.